Precioso soleado, luz y espacioso apartamento en el centro de la aldea de pescadores de Alvor. Apartamento en planta alta tiene un grande, abierta y soleada terraza con vistas al mar y al río. Su totalmente amueblado para vacaciones y dispone de aire. acondicionado / calefacción en el dormitorio. La cocina tiene una nevera / congelador, microondas, vitrocerámica y horno completo, lavavajillas, cafetera, hervidor de agua, etc. sala de estar con un sofá cama, TV de pantalla plana con caja de 150 canales y buena conexión Wi-Fi. Ropa de cama y las toallas están incluidas. El apartamento está completamente mantenido y el lavavajillas se agregó a la cocina en enero de 2017. Bienvenido a quedarse con nosotros y bienvenido a Alvor! Licencia de alquiler portuguesa 17809 / AL. Nota: Este apartamento no es para fiestas en grupo, condominio tranquilo! Cuarto de baño con bañera, inodoro, lavabo, lavadora, ventana de la clase espejo y calefacción por suelo radiante. Stunning views from a lovely apartment. Every aspect of the apartment was perfect and the central location superb. My wife & I are pensioners so the steps up to the top floor we took slowly, but to enjoy one of the best views in Alvor it was well worth it, and the exercise did us the world of good. We have just enjoyed a very comfortable stay in this lovely apartment. It was very clean and well equipped, and we had everything we needed. The views from the balcony were outstanding, and we enjoyed many beautiful sunrises and sunsets. The apartment was ideally located for our many local walks along the boardwalk and Alvor River, spotting many different birds, as well as for trips further afield to Lagos and the Monchique Mountains. We also enjoyed eating out at the excellent local restaurants, which served delicious seafood and other specialities. We would highly recommend this apartment, which has everything, and would definitely consider returning. Thank you again, Mia and Miguel. Perfect Apartment, Wonderful views and location! The apartment was perfect for our stay in lovely Alvor, and we had a wonderful relaxing holiday! The views are stunning and the balcony is a great place to relax in the sunshine! The apartment is very comfortable and well equipped, and in a quiet but central location. The heaters in the lounge were great when the evenings were chilly and there is air con/heater in the bedroom. There are two supermarkets within easy walking distance and it’s only a few minutes to the centre of Alvor with all of its shops,cafes and restaurants. The beautiful beach is also just a stone’s throw away and the boardwalk is perfect for a stroll. Easy communication and booking with the owners. Thanks to Miguel and Mia for their lovely holiday home, we hope to stay again! My husband found this apartment while thinking about a holiday in the little town of Alvor. We hadn’t been to Alvor before but he made an excellent choice. The apartment is 4 floors up in the middle of the town among locals. No long walk, steps or taxi ride required after an evening out in the town. On arrival at the apartment, we waited just a few minutes for Miguel to meet us to show us around. Our flight had arrived earlier than planned. The apartment had a lovely set up with open plan living room / dining room / kitchen and double bedroom and bathroom. There is a balcony the length of the property off both the bedroom and living area with sea and river estuary views which we loved. The apartment is very well equipped with everything you might need. We felt it was very secure as, apart from being on the 4th floor, it has electric shutters. Access is by a spiral staircase, no lift, so we would definitely recommend this apartment to people without walking difficulties. We are in our early 60s and quite fit. 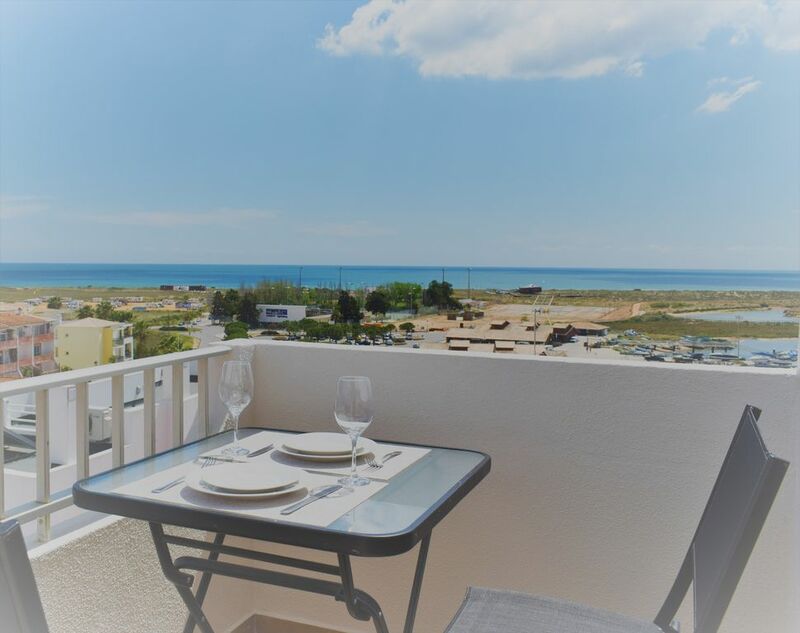 Die Wohnung liegt sehr gut, ist gemütlich und von der Terrasse hat man einen tollen Blick zum Meer hin, über die Ria und über die Dächer von Alvor. Wir haben uns sehr wohl gefühlt. Auch die Kommunikation mit dem Vermieter war bestens. Beach 5 min. caminar. 2min río. caminar. El aeropuerto de Faro Algarve 74 kilometros. Transferencias económicas Aeropuerto disponibles. (285 kilometros del aeropuerto de Lisboa.) Desde apartamentos principal paradas de autobús (a Lisboa, pueblos y aldeas y parques acuáticos) 3 minutos a pie. El apartamento está en el centro de la aldea de pescadores de Alvor. Praia de Rocha 3 kilometros. y la ciudad de Portimao (4 km. ), con fácil acceso. Alvor cuenta con supermercados, restaurantes, bancos, cafeterías, bares, tiendas de productos locales, piscina, descuentos en viajes en barco, excursiones de observación de delfines, parques acuáticos, excursiones como Sevilla, Lisboa, Fátima, ciudades históricas, jeep safaris etc. mapas gratuitos y Área de Información proporcionada. Booking Notes: On the booking 50% required, payment of the balance upon arrival. Upon arrival 200,00€ deposit required, which we will give back at end of your stay. Prices are based on 2 adults. Changeover Day: Prefer saturday, but its flexible Notes on prices: Ask for price for shorter or longer stays.